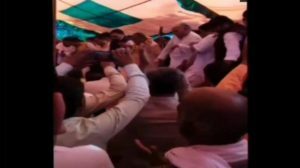 Trending: On Friday, a couple of BJP (Bharatiya Janata Party) workers attained injuries after a stage collapsed in the middle of their “Holi Milan” function that was being held in Samhal, Uttar Pradesh. Acadhesh Yadav the Kisan Morcha leader of the Bharatiya Janata Party attained injuries from the incident. Leaders and ordinary people who attained injuries were admitted to the police.